Instead of using the nuclear option to kill the filibuster, Senate Republicans can actually confirm nominees by forcing Democrats to debate. President Donald Trump’s nomination of Neil Gorsuch to fill Antonin Scalia’s seat on the U.S. Supreme Court has reignited the debate over the so-called nuclear option, a procedural tool that could be used to end debate on the nomination and force an up-or-down confirmation vote. Proponents of the nuclear option say it is necessary to prevent Democrats from using the filibuster to permanently prevent a vote to confirm Gorsuch. Opponents of the nuclear option say it will not only fundamentally alter the nature of the Senate, it will also greatly empower Democrats when they retake the Senate and the White House. At its core, the debate over the nuclear option highlights the tension between the need for debate and the need for finality on judicial matters. Unfortunately, exercising the nuclear option is a zero-sum game. If it’s invoked, debate is dead. If it isn’t, proponents say, Supreme Court nominations are dead. But what if there were a way to guarantee both an up-or-down vote on a Supreme Court nominee and debate about the nomination? What if there were a way to preserve debate while providing for a final vote? Thankfully, there is a way to accomplish that and, unlike the nuclear option, it doesn’t require any major trickery or parliamentary shenanigans. Instead, all it requires is for the Senate to abide by its own rules regarding debate. This option limits indefinite obstruction while preserving vital debate and protecting the unique nature of the Senate. Not only that, this particular strategy was even used in 1964 by Civil Rights Act proponents who were desperately trying to break a determined filibuster of that landmark legislation. Forget about the nuclear option and embrace the two-speech rule option. Here’s how it works. At any given moment while the Senate is session, one of only three things can be happening: debates, votes, or quorum calls. Every second of every Senate session is consumed by one of these three events. Misconceptions about the nature of one of these activities — debate — form the foundation of the controversy surrounding the filibuster (and, by extension, the nuclear option), especially as it concerns the nomination of Supreme Court justices. It is assumed that debate on these nominations must continue in the Senate until 60 senators agree that the debate is over. This leads to the assumption that 41 senators can indefinitely postpone an up-or-down vote on a Supreme Court nominee by refusing to vote for cloture, the Senate motion that ends debate on a matter. It is further assumed that these 41 senators need not even debate to prevent a final vote on a nominee. Instead, they need only vote against cloture. Rather than forcing 41 senators to perpetually maintain debate to prevent an up-or-down vote, current Senate practice puts the onus on 60 senators to end debate. However, this state of affairs is not actually required by Senate rules, nor by Senate precedents (to understand the distinction between the two, think of Senate rules as a statute and of precedents as case law, which can invalidate laws as originally written). The modern practice of allowing 41 senators to indefinitely obstruct up-or-down votes under the guise of debate is just that: a mere practice, indulged by courtesy. No precedents or rules require this state of affairs to continue. By enforcing Senate rules regarding debate — specifically Rule XIX — Senate Majority Leader Mitch McConnell can guarantee an up-or-down vote on Supreme Court nominees without resorting to the nuclear option, which would kill the filibuster and instantly eliminate all debate at the whim of a simple majority. In simple terms, it means that once each senator has spoken twice on a matter, debate on that matter is concluded no matter what. It means that a final up-or-down vote is guaranteed. It does not preclude the Senate from invoking cloture before all senators have spoken twice, nor does it preclude the Senate from proceeding to a final vote in the absence of continued debate. Unlike the nuclear option, which kills debate instantly at the whim of the majority, enforcement of the two-speech rule effectively sets a limit on debate. How does the two-speech rule work in practice? Under longstanding Senate rules and precedents, a legislative day is the period of time between when the Senate convenes and when it adjourns. The Senate could therefore have multiple legislative days within the same calendar day, or it could have a single legislative day span several months if it wished. Why is this important? It is important because the Senate could confine the debate over a Supreme Court nominee to a single legislative day. By doing so, the Senate would effectively limit the number of speeches meant to obstruct a final vote to the number of obstructing senators times two. After each obstructing senator spoke twice, and assuming no supporting senators wished to debate the matter, debate would be automatically concluded, because obstructing senators would no longer be permitted to speak. Then, once debate on a matter is closed, a final vote on the matter — in this case the confirmation of a Supreme Court nominee — would take place. Rather than current practice, which allows 41 senators to indefinitely prevent a final vote without ever lifting a finger or uttering a word of debate, enforcing the two-speech rule would require the obstructing senators to proactively and continually debate to delay a final vote. If at any point the Senate floor were abandoned by the obstructing senators, the chair could ask if there were any further debate on the matter. If nobody rose to speak, then debate would be over. Enforcing the two-speech rule would thus turn current practice on its head and force obstructing senators to do all the work to maintain the filibuster. It would require them to monitor the floor 24/7 for days and weeks on end to continue the debate. Even if they could muster that kind of stamina and coordination, there would still be a vote once each opposing senator had spoken twice. If opposing senators were to let their guard down even for a minute, the majority could move to end debate and force a final vote. Either way, a final up-or-down vote is guaranteed. The only question is how much pain the obstructing senators wish to inflict on themselves before that happens. Proponents of the nuclear option who oppose using the two-speech rule to force up-or-down votes generally offer a couple of arguments against the two-speech rule. Some of these objections are procedural, while other are practical. We’ll start with the procedural objections. There is simply no basis in Senate rules or precedents for the assertion that legislative day doesn’t mean legislative day for debate over presidential nominees. Opponents of this option assert that for the purposes of debate during executive session, when nominees are considered, a day actually means calendar day. This interpretation neuters the two-speech rule option by resetting the speech limit at midnight each day. Unfortunately for two-speech rule naysayers, this assertion has no basis in fact. First, the plain text of Rule XIX, which was recodified by the Senate in 1979 for the express purpose of adding the term “legislative” before the term “day,” makes clear that for purposes of debate, a day means a legislative day, regardless of whether the Senate is in legislative or executive session. Second, there is no precedent anywhere in the entire history of the U.S. Senate to support the notion that the two-speech rule requires calendar day limitations when debating a matter in executive session. While two-speech rule naysayers point to a passage in Riddick’s Senate Procedure as alleged proof of their point regarding the definition of day during executive sessions, this argument has three fatal flaws. First, the precedents cited occurred long before the Senate explicitly recodified Rule XIX to use the term “legislative day” rather than just “day.” That new rule trumps any prior precedents on the matter, regardless of their applicability. Second, these precedents applied only to initial consideration of executive matters, not to debate over them (a calendar day is used to expedite consideration of treaties and presidential nominees, which are required under the rules to lie over a day before they can be considered, not to delay their consideration). Finally, the definition which naysayers say is required by Riddick’s is grammatically nonsensical and would create the nonsense term “legislative calendar day” within the rules. There is simply no basis in Senate rules or precedents for the assertion that legislative day doesn’t mean legislative day for debate over presidential nominees. The two-speech rule clearly limits the number of speeches on any given matter within the same legislative day, regardless of whether those speeches occur in legislative or executive session. As political science professor Nina M. Moore noted in her book “Governing Race: Policy, Process, and the Politics of Race,” Senate Majority Leader Mike Mansfield kept the Senate on the same legislative day for 81 calendar days, from March 30 to June 19, to enforce the two-speech rule to break the filibuster of the 1964 Civil Rights Act. The two-speech rule option preserves debate while still guaranteeing an up-or-down vote. Contra the objections that the two-speech rule can’t be used to limit dilatory debate, rigid enforcement of the two-speech rule was a key component of the push to enact the 1964 Civil Rights Act in the face of a bitter and determined opposition. The final procedural objection to the two-speech rule is that while it may limit debate, it doesn’t limit various other shenanigans Democrats could use to prevent a final vote. This is true, but the same objection applies to the nuclear option or even the 60-vote cloture rule. It doesn’t preclude Democrats from using those same shenanigans after debate is closed. In both instances, the chair would be eventually required to declare that the shenanigans were dilatory in nature, the majority would affirm the ruling, and the vote would occur. The difference between the two-speech rule option and the nuclear option is that the two-speech rule option preserves debate while still guaranteeing an up-or-down vote. That takes care of the procedural objections to the two-speech rule option. The other objections are primarily practical; namely that it would be too difficult to pull off. The first of these practical objections concerns the question of whether the option limits debate enough to be useful. Skeptics of the two-speech rule assert that debate could go on for months depending on the stamina of the obstructing senators (48 senators times two speeches each equals 96 separate speeches). This particular objection assumes that a single senator could theoretically monopolize the floor for a day at a time, limited only by his or her physical stamina. Senate rules, however, give the Senate majority the ability to break up speeches with motions requiring votes. That tactic would result in no fewer than two Democrat speeches burned each day. The easiest way for the Senate majority to accomplish this would be by filing cloture motions on separate matters each day and ensuring that these motions ripened during Democrat nomination speeches. These motions would ripen an hour after the Senate convened two days later (cloture motions must lie over a calendar day), a vote would automatically be held on the motions, any Democrat speaking against a nomination would lose the floor, and that would be the end of that particular speech. That tactic would result in no fewer than two Democrat speeches burned each day. In all likelihood, that number would be much higher given that most senators simply don’t have the stamina to speak for more than a few hours at a time. Rather than having to wait several months for each senator to exhaust his or her two speeches, Democratic opposition under the two-speech rule option would probably melt away after no more than a few weeks. By way of comparison, since 1980 the amount of time between initial nomination and Senate confirmation of a Supreme Court justice has averaged 68 days. Even if only two opposition speeches were exhausted each day, that would still leave nearly three weeks for senators to weigh the merits of a particular nominee prior to beginning formal debate on the nomination. In short, the process historically allots more than enough time for the two-speech rule option to be successfully used without needlessly prolonging matters. The other practical objection is that enforcing the two-speech rule to guarantee a final up-or-down vote would create political problems for Republicans by allowing Democrats to monopolize the floor day in and day out for weeks or months at a time. This objection is based on either a misunderstanding of or an unfamiliarity with the rules and precedents of the Senate. Skeptics assume that no other business could be transacted on the floor while a Supreme Court nomination was pending. This is incorrect. Senate Republicans would also have the power to force Senate Democrats to make their speeches in the middle of the night when nobody is watching. The Senate majority has the power to bounce back and forth between legislative and executive session at will. As a result, the Senate could conduct its legislative business during the day and confine debate over the pending presidential nomination to the wee hours of the night. Thus, not only would the Senate be able to dual-track its legislative and executive business, Senate Republicans would also have the power to force Senate Democrats to make their speeches in the middle of the night when nobody is watching. This would deprive Democrats of media oxygen for their arguments and tire them out over time, as there is often little desire among older senators to futilely rant at the C-SPAN cameras at three in the morning. Rather than creating practical problems for Republicans, the two-speech rule option would actually reveal Democratic obstruction for what it is: vacuous and half-hearted. It is extremely unlikely that a Democratic caucus with eight septuagenarians (not including the two Independent senators who are in their seventies), one octogenarian, and an average age of 62 years is going to have much of an appetite for hours-long midnight barnburners for weeks on end. Compared to the controversial nuclear option, which would give the majority carte blanche to eliminate debate on all nominees from now until eternity, the two-speech rule option preserves debate while still guaranteeing a final vote on Supreme Court nominees. It balances the desire to prevent indefinite obstruction with the desire to ensure votes for well-qualified Supreme Court nominees. And it does so without fundamentally altering the nature of the Senate, which was specifically created to provide for lengthy debate on matters of national concern. 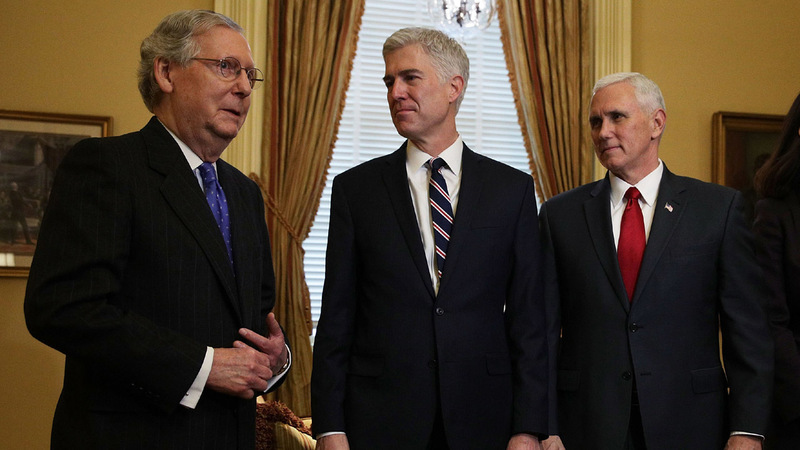 Gorsuch and future Supreme Court nominees can be confirmed without the nuclear option. They can be confirmed without arbitrarily limiting debate. Most important, these nominees can be confirmed under the Senate rules not by ending debate, but by encouraging it. The two-speech rule option provides the best of all worlds by addressing the concerns of both sides of the Supreme Court nomination debate. Instead of nuking debate, the two-speech rule option merely nukes obstruction. And it does so by encouraging debate and by encouraging the input of every single senator. Current Senate practice empowers a lazy minority by allowing indefinite obstruction without requiring any effort or debate. If voters want a confirmation process that simultaneously encourages debate while limiting obstruction, they should demand that the Senate set the nuclear option aside and invoke the two-speech rule option instead.